MeetUp.com, the popular and rapidly growing community for group gatherings, updated their design tools in April 2013. Many of us participate in business related events on Meetup to network with area professionals, meet like-minded experts and connect with our communities. It can also be quite fun to help manage a Meetup. Meetup provides a strong platform with well-organized tools for scheduling, promoting and managing group meetings of various types. With the basics, Meetup offers a few color choices and font styles to personalize your group’s page. But as you search through a few of the group pages, you may start to see some of the same page styles, with generic looking titles and background colors. Some groups are popular and actively updated with pictures and new events, but the template-look of the page does not reflect the “brand” and energy of the group. For Meetup groups that are associated with an established organization or business, it is best to brand the Meetup page similar to your website design. Meetup launched slight changes to it’s “Appearance” tools in April 2013. Formerly, there was an Appearance section under Group Settings where you could adjust some settings. Now, you can find a separate tab for “Edit appearance” under the Group tools menu tab. After selecting Edit appearance, three new options will appear at the bottom of the screen. I didn’t notice them at first, since they are located so differently than the former GUI. Prepare a logo or nicely branded banner graphic using something like Photoshop or from your other graphic design media. Save is as a .jpg and .png file. Make sure it includes your group’s name so it is bold and clear for new visitors to read. This banner will end up replacing the default text title at the top of your page. Make sure you are logged in as an admin of your Meetup page. 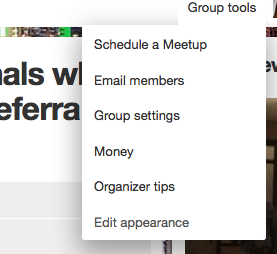 Click on the Banner image option at the bottom of your Meetup page. Upload your new image, and wait a few seconds for the preview to load. If it looks satisfactory, click the Keep it or Save button. Meetup offers a few simple color and pattern options in their templates, but wouldn’t it be nice to customize that with photos, logos, or other special colorful patterns? Since Meetups are often centered around local communities, how about a beautiful photo of your city or a great shot of the venue where you meet? You will want to prepare a fairly large image so that it can easily peek around the sides of the page content. Again, while logged in to access the Edit appearance tools, click on the Background image option. A similar Upload an image option will appear. Upload your new background image. Once uploaded, you can also adjust the image to be tiled (repeated) or stretched or centered, to fine tune it’s display. Now that the design of your group page is embellished, don’t forget to keep the content regularly updated. The most successful pages are regularly updated with photos, ratings, new events and comments. This keeps the curent members engaged in the group and also increases the exposure of that page in search results on Meetup.com. Encourage your members to take and post photos to the Meetup group after events. Meetup.com has a great system of sending automated reminders to members asking for event ratings and comments. This is an ideal time for participation. when I upload a banner for the meetup page, it doesn’t cover the entire area but show up only in the middle, I have tried different photos for the banner, any idea to create a custom banner for the meetup page? Hi, Sunil! Meetup may have changed their banner size requirements, or you might need to create something with a background that you can tile and repeat. Meetup’s support team is great, so I recommend contacting them for guidance. I created a custom color palette for my meet up page. How do I change the green RSVP buttons to another color? You can try Edit Appearance under your Group Tools, then in the bottom toolbar click Color Palette and scroll down to pick Custom Colors. You can specify a code for your button colors. I think it will be a theme for all buttons.